We've discussed some of the considerations involved in deciding whether to specialize in one market or to trade a diversified portfolio of markets. Proper diversification can go a long way towards reducing your risk of ruin. It is a commonly known fact that some markets trade similarly while others do not. The extent to which two different markets trade similarly is referred to as their "correlation." A statistical function known as the "correlation coefficient" can tell you how closely the price fluctuations of two markets mirror one another. Two markets that trade exactly the same would have a correlation coefficient of 1. On the other end of the spectrum, two markets that trade exactly the opposite would have a correlation coefficient of -1. Markets whose price movements have no correlation whatsoever would have a correlation coefficient of 0. A lack of correlation between markets offers an opportunity for astute traders to minimize the fluctuations of the equity in their account. Let's illustrate this by looking at two different portfolios. Consider a portfolio trading T-Bonds, 10-Year T-Notes and 5-Year T-Notes using the same approach. Each of these contracts fluctuate based upon changes in interest rates. These contracts will generally rise or fall together with the main difference being the magnitude of their price movement. If you are trading them all using the same approach it is likely that at times you will be long all three contracts or short all three contracts. If interest rates are generally rising, each of these contracts will likely fall in price. If interest rates are falling, each of these contracts will likely rise in price. As a result, when you are on the right side of the market you will certainly score some big gains. However, if you are long all three contracts and interest rates spike higher you will likely take a significant hit. You may achieve good profits trading this portfolio, but in terms of risk control the thing to recognize is that you will almost certainly experience some sharp swings in account equity. If these swings are more than you can handle you may be forced to stop trading before reaping the full benefit of your approach. Now consider an account trading a portfolio of T-Bonds, Natural Gas and the Japanese Yen. These markets fluctuate based on different variables. If you are trading them all using the same approach there is no inherent reason to expect them to trade in a similar manner. At times they may all rise or fall in unison, but more often than not they will be rising and falling independently from one another. Also, there may be periods when two of the three markets will be trading in a narrow range and offering few profitable trends. At the same time the third market may be trending strongly, thereby giving a trader the opportunity to make enough money trading that contract to offset his losses in the other two contracts. The equity curves for these two portfolios using a particular system are shown in Figures 3-1 and 3-2. Note that the portfolio trading just the three interest rate contracts actually made more money over a four and a quarter year test period than the diversified portfolio. In retrospect, a person could say that this was the "better" portfolio because it made more money. But take a close look at the relative choppiness of these two equity curves. 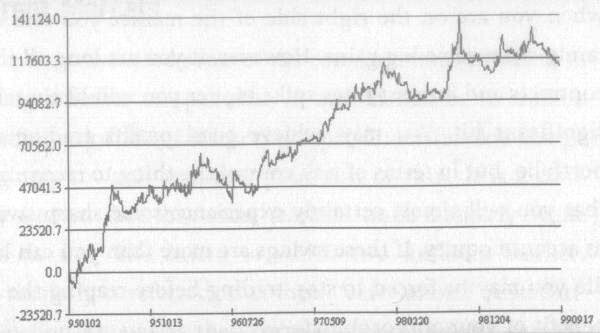 Whereas the interest rate only portfolio had a number of sharp drawdowns and some drawn out flat periods, the diversified portfolio for the most part crept steadily higher throughout. 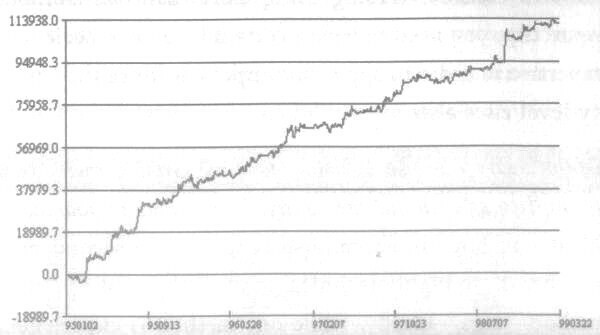 Most traders would have a far easier time sticking to a trading program trading the diversified portfolio in this example, even though it earned less profits.